Green Eye Wins a Benny Award! Green Eye for Design recently won a Benny (Benjamin Franklin) Award for the design of the Doylestown Food Co-Op Member Appreciation Coupon Booklet. 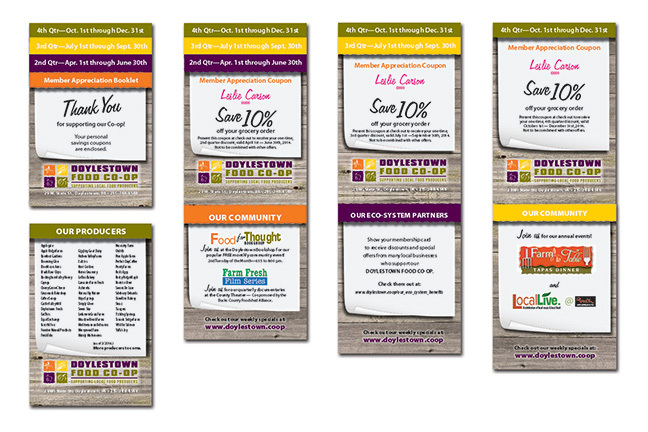 Using an interesting and inviting “stepped” format, the coupon booklet encourages members to stock up on groceries by offering 10% off one order each quarter. The booklet also contains useful information about the Food Co-Op, suppliers, eco-system partners, and events. The Benny Awards are sponsored by the Philly Direct Marketing Association and recognize creative and marketing excellence in the Delaware Valley. 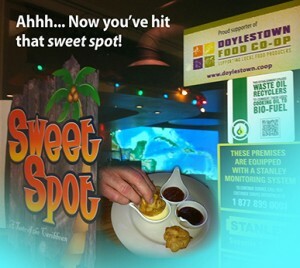 In response to accepting the award, Jean Cauller of Green Eye for Design said, “It’s gratifying to achieve this recognition among my peers, and it’s great that it also draws attention to the Doylestown Food Co-Op.” The award also recognizes Lydia Grossov of Expresso Design for the Doylestown Food Co-op logo and branding; and, Neal Carson of Bucks Digital Printing for spearheading this effort and making the format concept a reality. Green Eye for Design specializes in creating multi-use formats and effectively designed marketing materials that achieve results — not just in print, but across multi-media. Says Jean, “Graphic design is more than meets the eye. It’s about finding new ways to reach your target audience.” Jean works closely with clients to help ensure maximum return on their marketing investment. The Doylestown Food Co-op is not just another grocery/market. Join Us! and make it happen. The Doylestown Food Co-op is so much more. Recently, when I was updating my website, I was looking at all of the promotional materials that I helped to develop for the Doylestown Food Co-op’s various programs and fund raisers. I was totally amazed at all the Co-op has done over the past 2 years. Our Doylestown Co-op has held fundraising events like “LocalLive at Puck” — supporting our local food producers and showcasing local musicians like Cool Beans and The Cherry Lane Band — and “LocalFest”, our fall festival featuring a chili cook-off with chili recipes from local restaurants and our own community. The Doylestown Food Co-op educates our community with Town Hall Meetings, and in January the very popular “Food for Thought Book Club” began having monthly meetings at the Doylestown Book Shoppe. Also, The County Theater provides the venue for the “Farm Fresh Film Series” which features documentaries such as Food Inc. and Locavore. My favorite events are the potluck membership meetings — our members are the best cooks! Stay tuned-in for more information on our first “Farm-to-Table Dinner” on August 24th. Many of our Member-Owners have dedicated hours of service creating and organizing these events to make Our Store a reality. Join Us! and take advantage of many discounts provided by our Eco System Partners. 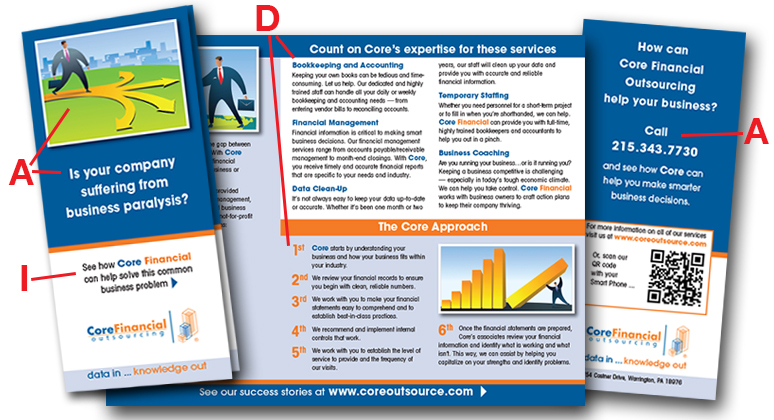 Are you using the AIDA formula in your advertising and marketing materials? When creating any promotion you want it to be as effective as possible. This simple AIDA formula can help you get results. Include a compelling visual element and/or a strong headline to attract ATTENTION. Add an informative subhead and/or lead-in sentence to build INTEREST. A benefit — answering the question, “what’s in it for me?” — is essential to create DESIRE for your product or service. Get results with a strong call to ACTION. A The colorful illustration of the businessman on a path leading to multiple directions, and the strong headline in the form of a question, attract ATTENTION. I The subhead builds INTEREST and intrigue and leads the reader to the solution inside. A The back of the brochure asks the reader to call — and to take ACTION. and get the right message … to the right audience … at the right time. 2. Advertising— In tough economic times, many businesses cut back on advertising. growth when the economy improves. Advertise now… so you can continue to take the vacations you deserve! that focus on the most important message: yours.